SHENZHEN, China -- The plaza outside Shenzhen's Mass Sports Center looks like any you can find in Chinese cities. But if you look closely, you can still see a critical difference. Unlike most infrastructures in China, the plaza here has no drains. When rain falls lightly, the water either filters down to the underground through permeable pavements or is soaked up by gardens designed to catch rain. Almost no rainwater flows into street gutters around this plaza. During a period when many big cities -- most recently Houston -- are experiencing extreme rainfall and major flooding, the innovations show in a small way the kinds of preparations that may be needed. The plaza is one of the showcases for China's ongoing efforts to redesign its cities. The country used to rely on drainage systems to remove rainwater. But as extreme weather events increase, Chinese city planners have begun to give equal attention to new climate-resilient urban designs. 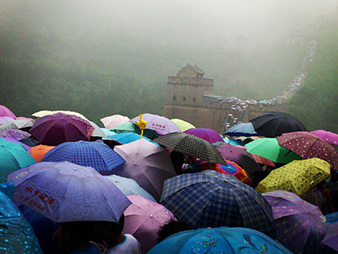 Tourists lining up outside Beijing in August 2012 for a walk on the Great Wall were hit by one of the worst cloudbursts in 30 years. Flooding stopped their tour. Photo courtesy of Flickr. Experts say that climate change has played a role in the increase of urban flooding, producing more rainfall during shorter periods. Besides that, rapid urbanization has outpaced stormwater removal. Although China's drainage networks extended to reach 288,838 miles as of 2013 -- 20 times longer than that of 1981 -- it still can't catch up with the fast expansion of Chinese cities. Known as "sponge cities," the new design aims to build up infrastructure to collect excess rainfall and integrate flood control in urban planning. As a result, cities will not only be able to deal with too much water, but also reuse rainwater to ease their thirst when there is not enough water. The concept of "sponge cities" became so popular in China that it caught the eye of no less than Chinese President Xi Jinping. In 2013, Xi called for strengthening the development of "sponge cities" in his speech to urban planners. Earlier this year, the Chinese central government pledged to provide billions of dollars in financial assistance over the next three years, in an effort to help 16 cities morph into "urban sponges." Besides the selected pilots, other cities in China have also carried out their own experiment. Here, in the Mass Sports Center of Southern China's Shenzhen City, developers have developed an area of 118,403 square feet with porous bricks and flood-tolerant plants. When it rains, the permeable pavements and rain gardens soak up most of the rainwater. In an average rain year, this design helps harvest about 10,000 cubic meters of rainwater -- a precious resource in the city where more than two-thirds of its water supplies are imported. Since the design can absorb stormwater, it also helps ease the burden that heavy rains have posed on the city's drainage systems. While the buildup of "sponge cities" does not mean the end of constructing gray infrastructure -- a term used by urban planners to describe street gutters, storm sewers and other traditional methods of dealing with rainwater -- experts say that it does reduce demand on costly drainage systems. Take Central China's Changde City, for example. By replacing 15 percent of its impervious urban areas with rain gardens or so-called bioswales -- vegetated gullies designed to retain stormwater -- the city had to upgrade only half of the drainage network that traditional solutions would require. Yet it achieved the same capability to withstand heavy rains, said Peng Chiyan. He is a project manager of Wasser Hannover GmbH, a German company that advises Chinese cities on sustainable water management. According to Peng and others, China needs "sponge cities" badly, but scaling up remains a challenge. For one, although the country last year issued a technical guidance, this is far from enough for Chinese urban planners to figure out how to build cities like sponges. In addition, the buildup of "sponge cities" requires cooperation among landscape designers, road builders, drainage solution providers and many others. However, it is difficult to get different authorities to agree on the same approach. But some urban planners believe that the resistance could fade away as "sponge cities" speak for themselves. Zhao Jiang, president of Zhenjiang Urban Planning and Design Institute, knows this better than others, because he has witnessed a sea change in attitude toward his work. "It is challenging to roll out retrofitting work in existing urban areas, particularly in residential areas," said Zhao, whose institute has been helping Zhenjiang, a city 143 miles east of Shanghai, to embrace the new urban design. "Every time I went to the retrofitting site, I got cursed by residents there," Zhao recalled. He said that such hostility lasted for a while until a recent rainy day. "It was pouring rain, but residents there did not see their neighborhood being overwhelmed by rainwater as it used to be. Since then, they no longer complained. Instead, they became our supporters," Zhao said with a smile.